Find My iPhone, that convenient service from Apple that you wish you would never have to use, has found its way to the Mac. Aptly renamed to Find My Mac, this new service does what it did on the iPhone, it helps you track down your Mac in case you have lost it. The service is currently available only to developers who have access to the iCloud service. Along with being able to locate your Mac, Find My Mac can also play a sound, send a message, remotely lock it and even wipe the hard drive clean to prevent unauthorized access. The ability to locate uses only Wi-Fi since Macs don’t have a GPS radio inside of them so won’t be perfectly accurate but it’s still better than nothing. 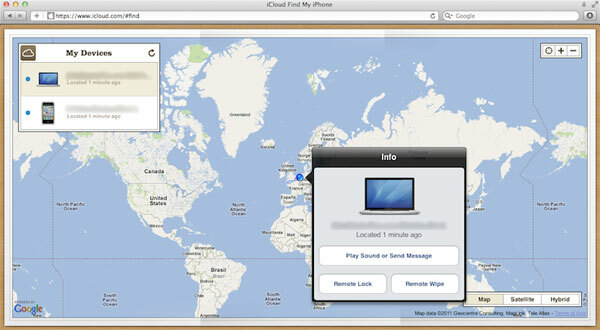 The Find My Mac service is expected to go live along with iCloud this fall for the general public. But if you have a developer account you can try it out right now.